The Chinese population of Weaverville started to decline after the 1850s, as gold ore became scarcer, and many left to work on railroad construction. By 1931 only 16 were counted in town. In 1933 the Weaverville Chamber of Commerce went on record in support of making the Joss House a State Historic Park, but nothing came of the proposal for another 23 years. 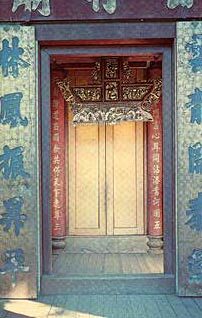 Without the efforts of Moon Lim Lee, the Weaverville Joss House probably would not have survived. Moon Lee started his business career at the age of seven, selling vegetables from a horse-drawn cart. He continually improved and extended his enterprises and became a successful grocer and merchant. He worked constantly in his later years to preserve the Joss House and get it added to the State Park System. He was appointed trustee of the temple in 1938. Moon Lee continued to promote the Joss House as a historic treasure for his own people and for all California and the world until his death in 1985, at the age of 82. Through the efforts of Moon Lee and many others, the Weaverville Joss House became part of the State Park system in 1956. It was renovated and opened to the public in July 1957. California State Parks later added a visitor center, other structural improvements on the grounds, a parking lot, and landscaping. The Kuan Yin pool, near the visitor center, was built in 1985 by the Weaverville Joss House Association. The State Park and Recreation Commission classified the Joss House as a State Historic Park in September 1963. It has been named California Historical Landmark No. 709. The J.J. Jackson Memorial Museum and History Center displays Trinity County's history Early mining equipment is featured. The History Center houses thousands of historical and legal documents, papers and photographs. The park is adjacent to the museum. Picnic tables are provided.